View Product Sheet for more specifications. Available in both single and double pole, with alternate action and momentary action. Rating: 2 HP @ 240 VAC; 1 HP @ 120 Vac; other ratings up to 25 AMPS available. Vacuum is factory set in adjustable ranges. Some models are field adjustable. 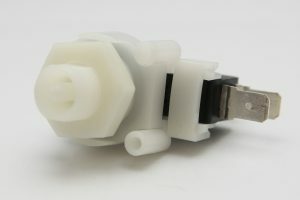 Adaptor available to enable Tinytrol® retrofit for certain competitors’ models with small diameter mounting thread. Materials: Acetal body; diaphragms available in various materials: nitrile, silicon, neoprene, EPDM, etc. Pressure is factory set, from .25 PSIG to 65 PSIG. Some models are field adjustable. Adaptor available to enable Tinytrol® retrofit for certain competitors’ models with small diameter mounting thread. View Magictrol sequencing air switch specifications. Allows you to switch up to four separate pieces of equipment in sequence, alternate action. 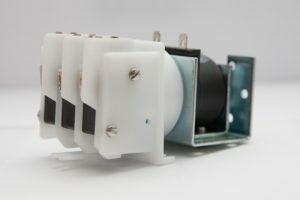 Each time an air pulse is applied, a stepping cam is rotated through three or four positions, actuating a combination of two or three microswitches. For long distances, available with solenoid operation. Rating: 2 HP @ 240 VAC; 1 HP @ 120 VAC; 21 AMPS to 250 VAC; other ratings up to 25 AMPS; snap switches available. Material: Acetal body/acetal mechanism; silicon rubber diaphragm; stainless steel spring.